For the second straight game, the Leafs struggled to find the net; a stark contrast to the high-powered offensive outbursts that started their season. The result was a 4-1 defeat at the hands of the St. Louis Blues. Frederik Andersen took the loss in goal, stopping 21 of the 24 shots directed his way. 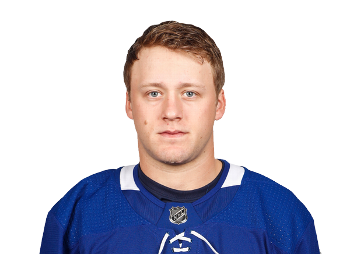 Morgan Rielly was the only player to score for Toronto. He leads all NHL defencemen in scoring with 14 points (four goals, 10 assists) and was in a three-way tie for second place in league scoring at the time of this writing (Auston Matthews, 16 points). During the first TV timeout of the opening period, Blues centre Tyler Bozak was honoured with a video tribute in recognition of his nine seasons in a Leafs uniform. Zach Sanford added to Andersen’s typical October struggles with a shot to the glove hand that beat the Leafs goalie on the short side. Morgan Rielly and Travis Dermott were caught guarding the same attacker behind the Leafs’ goal line on a penalty kill, allowing Ryan O’Reilly to move into the slot area unguarded for a one-timer, St. Louis’s third goal of the game. “I think we’ve got to do a better job coming out of our own end and being a little bit cleaner and allowing us to use our speed and get on the forecheck and be tenacious and hungry for pucks and put pressure on teams and not give them time and space,” -John Tavares, on how Pittsburgh and St. Louis have made adjustments to stop the Leafs. For a Saturday night game against an opponent that had won just once in six previous outings, the Leafs looked tentative and unenergetic. Toronto generated just four shots in each of the first two periods. Rielly’s third period goal ended a drought of 116 minutes, 37 seconds during which the Leafs hadn’t scored, dating back to Monday night versus Los Angeles, a stretch of nearly two complete games.